We are in the age of sustainability. We buy energy-saving light bulbs and hybrid cars. I will furiously rummage through the office trash to retrieve an aluminum can that didn’t make it into the correct recycling bin. We want our ribeyes to be grass-fed, our eggs to be free-range, and our kale to be locally grown by a farmer in the next county. What could be more local than getting food from your own yard? And I’m not talking just a vegetable garden in the back. “Edible Landscapes” strive to make the plants that add ornamental value in the yard do double duty in the kitchen. 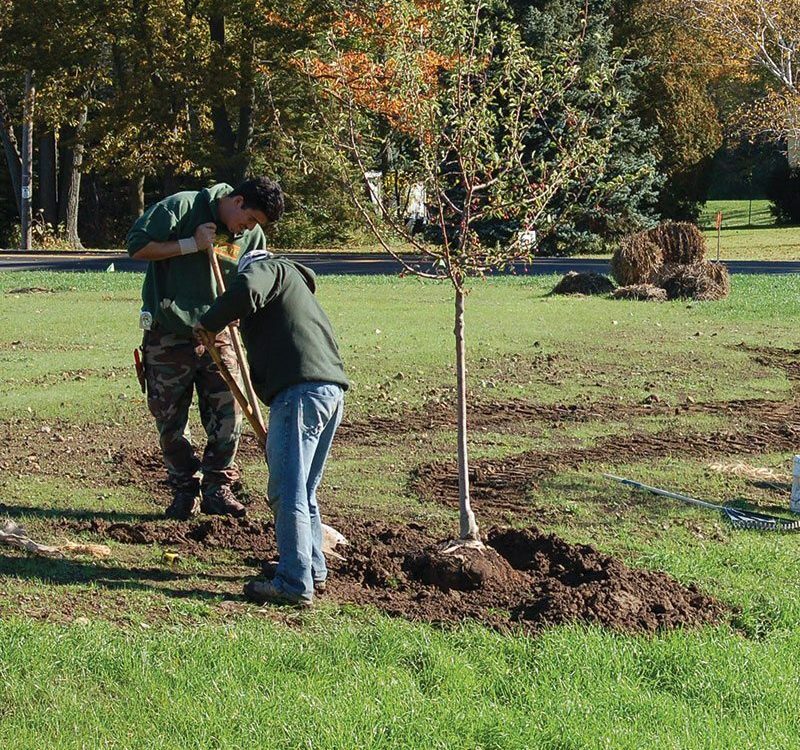 You need a shade tree anyway, why not choose one that can help out at dinner time, too? 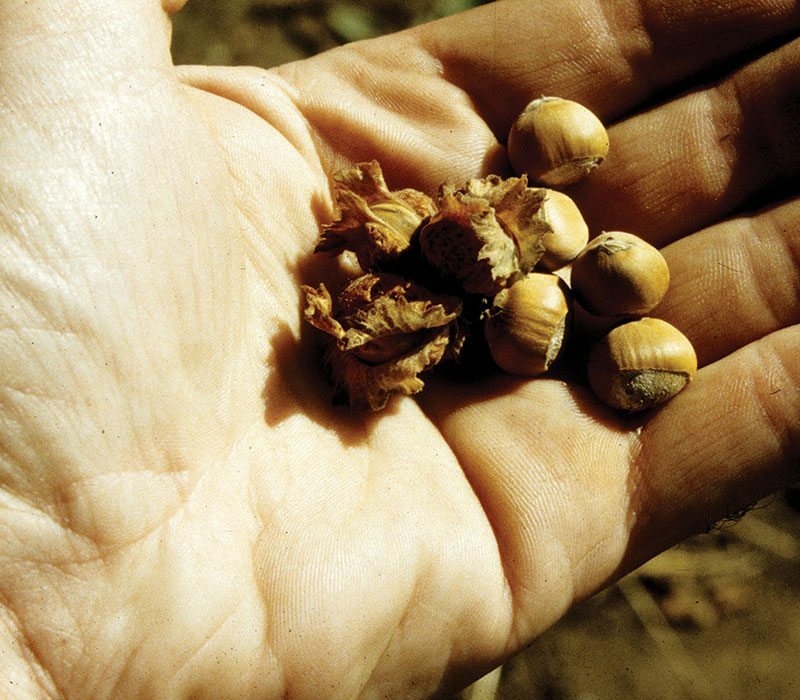 Acorns have long been used by Native Americans for flour. 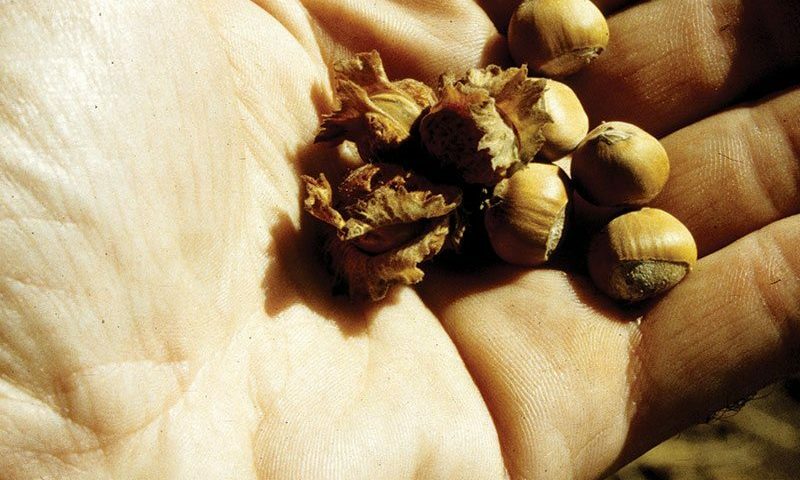 White Oak species like Bur Oak and Swamp White Oak have acorns that contain fewer tannins so are less bitter than Red Oaks. If you can find them, Chinkapin Oaks are even better. A very natural flour substitute for those with gluten intolerance. Sometimes called “bee trees”, the late spring flowers are a magnet to pollinators. The flowers produce lots of nectar that make a high-quality honey. The seeds can be cracked open in fall and snacked on like a small nut. Copious amounts of olive-shaped red fruits will cover the tree in late summer. They are tart and refreshing, very similar to a cranberry and make a lovely red jelly. One of the first plants to signal spring’s arrival, the white flowers give way to dark blue pea-sized berries that taste similar to a blueberry. If you can get to them before the birds do, they make a tasty pie. Just don’t eat too many slices because the fruit also acts as a diuretic. Able to grow in deep shade, Elderberries can quickly fill in an understory to replace invasive buckthorn. Both the flowers and fruits are edible. The flowers are what give the St. Germaine Liqueur its delicate flavor. The fruits have long been prized in jellies, wines, and syrups. The nuts are similar in taste and shape to its European cousin, Corylus avellana, only smaller. Male and female flowers are born on the same shrub so you don’t need two to in order to produce nuts, but having more than one puts you on the path to a bumper crop. Sumacs light up the slopes of Wisconsin highways in fall. If you have the space, Sumacs will colonize and stabilize a steep slope in your own yard. The unusual conical clusters of small red drupes have a citrusy flavor. Place about two cups of the rust-colored berries in a clean pantyhose foot, steep in a quart of water, and sweeten to taste for a lemonade-type drink. Dried seeds can also be ground into a powder that yields a tart flavor which chefs sprinkle on fish, chicken, and salads, basically anywhere that calls for fresh-squeezed lemon juice. Revolutionary period Americans used the dried leaves of Ceanothus americanus as a black tea substitute. The small scale shrub will thrive in dry sites, whether in sun or shade, a good alternative to spireas. White spring flowers and intense fall color makes Black Chokeberry a good shrub in the landscape. The fruit is too tart to eat raw (hence the common name of Chokeberry) but harvest after frost to be cooked and sweetened in pies and preserves. The dark purple fruit is higher in antioxidants than blueberries and is easier to grow in alkaline soil. Too seedy to eat raw, the fruit is excellent in jellies. The thorny nature of this Wisconsin native shrub makes it a good barrier to intruders. In the mint family the dried leaves of Monarda fistulosa, make a tea that tastes similar to Earl Gray. The lavender flowers also attract important pollinators to your yard, so place near the vegetable garden to take full advantage of this trait. Ostrich Ferns are easy to grow in a shady location. The young, tender, tightly coiled shoots called fiddleheads can be steamed and used in salads or sautéed in a little garlic and butter. But be sure that your fiddleheads are coming from Matteuccia struthiopteris, because other kinds of ferns can be toxic. Use these two types of native alliums as you would chives; all parts of the plant are edible, from the bulbs to the grass-like succulent leaves to the round flower clusters. Just be aware that they do like to colonize where they are planted, so give ’em some room. A great native groundcover for shade that also inhibits the growth of invasive garlic mustard. Plus the rhizome root structures have a slightly less strong flavor that domestic ginger for cooking. We’ve all got them in our yards, so why not reach for the salad fork instead of the herbicide? Dandelions are a good source of beta carotene. Just like lettuce, it’s best to harvest the leaves when they are young, before they get too bitter. Tear and toss a handful in your next salad. The yellow flowers can also be eaten and make a pretty garnish. Garlic Mustard was brought over from Europe by settlers for its culinary applications. However, they probably didn’t realize what a huge pest this biennial would become. When you are pulling the rosette leaf clusters from the ground save some for the kitchen. The garlicky flavor is a nice addition to salads, can be tossed in a stir fry, or I’ve even seen pesto recipes that use Garlic Mustard instead of basil. Again, use the young leaves so to avoid bitterness.